Today the O.G. Wood Fire Pizza truck stopped by my office and I just couldn't resist. The idea of having a wood fire pizza oven on a truck is slightly odd, but it works pretty well. They offer 10" round pies, all made to order right in front of you. I decided to go with the Americano, which is tomato sauce, provolone, fresh mozzarella, pepperoni, and basil, for $10. After waiting roughly 20 minutes for the 4 orders ahead of me and my own, I finally got the fresh hot pizza in it's own personal pizza box. Opening the box, the pizza looks great, almost picture perfect, but once you dig in, you realize it's not that easy to eat. The crust around the edge has a lot of black burned patches, which really add some burn flavor. While some people might like the char flavor, I'm not a huge fan of it. The crust towards the middle of the pizza was a different story; it was very thin and fairly soggy, so thin and soggy that you have to fight to keep the slice from falling limp and all the toppings falling off. 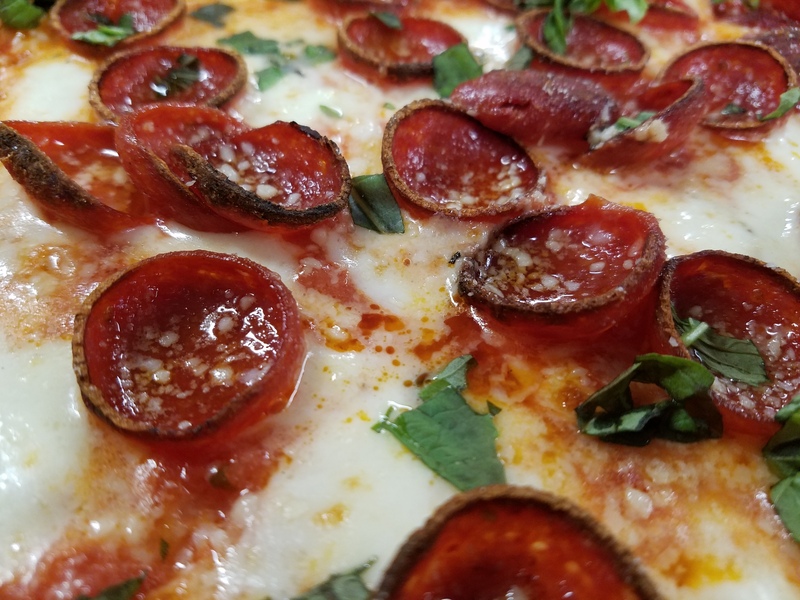 Speaking of toppings, the cheese and pepperoni were good, the pepperoni especially, with nice cupping and charring on the edges. The fresh basil leaves were also good and added a lot of flavor. The sauce was lacking in quantity, I really had to try to find a saucy spot to actually taste it, which turned out to mainly taste of tomato.